Betsy Dirksen Londrigan announced she will run for Congress again in 2020. Standing alongside her is her husband, Tom, and her son, Jack. 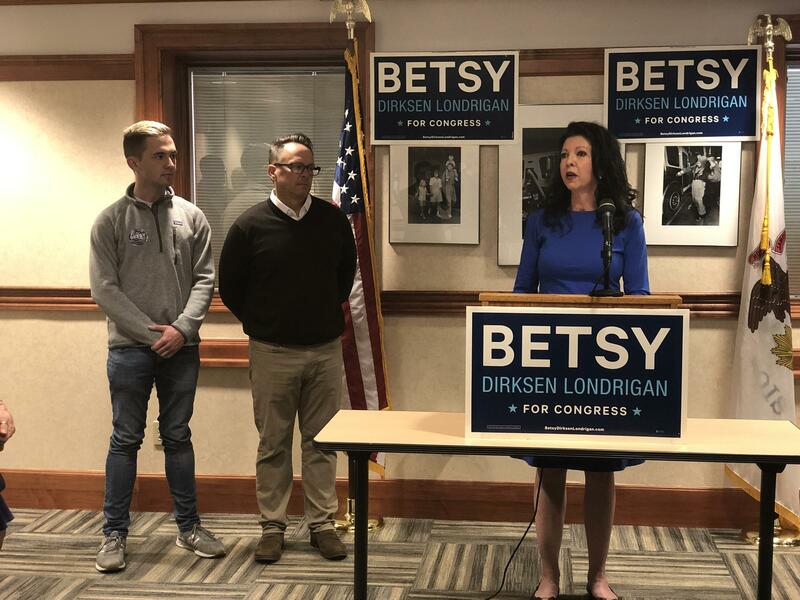 Dirksen Londrigan campaigned on healthcare as the most important issue in 2018. She told the story of her son, Jack, who almost lost his life after a tick bite, but he survived thanks to her family’s health coverage. That almost won her the district. In 2020, she'll be using the same message. But how does she plan to get a different outcome? Much like the 2018 campaign, Dirsken Londrigan talked about Congressman Davis' vote to repeal and replace the Affordable Care Act. But Ashley Phelps, a spokesperson for Davis, said these are "the same false attacks that voters in this district rejected last election." "Congressman Davis' constituents know that he is one of the only members to pass a bill to fix an issue with Obamacare, they know he's working to pass reforms to make health care more affordable, and they know which party is fighting to cut taxes and which party, in both Washington and Springfield, is trying to raise taxes to pay for higher spending," she said in a statement. Dirsksen Londrigan said she acknowledges Davis does well in rural communities, so she'll be working harder to win support there. Dirksen Londrigan didn’t take a stance on national issues like the Green New Deal and a Democratic party that is getting more and more progressive. The National Republican Congressional Committee sent an email shortly after the announcement stating Dirksen Londrigan embraces the "socialist Democrats' agenda." The email said, in part: "This includes moronic socialist Democratic ideas such as single-payer health care, the Green New Deal, legalizing infanticide, and embracing anti-Semitism. Good luck with that, Betsy."